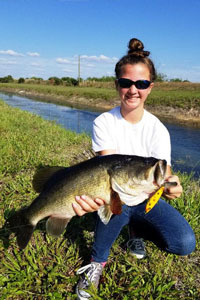 Angler Emily Rose Hanzlik – age 13 – caught and released this 3.53-kilogram (7-pound 12-ounce) largemouth bass (Micropterus salmoides) on May 8, 2018 while fishing the J.W. Corbett Wildlife Management Area in West Palm Beach, Florida, U.S. Hanzlik needed 10 minutes to land the fish after it hit the Johnny Rattler lure she was casting from the bank. If approved, the catch will earn Hanzlik the new women’s 6 kg (12 lb) line class world record which currently stands at 3.4-kilograms (7-pounds 8-ounces). 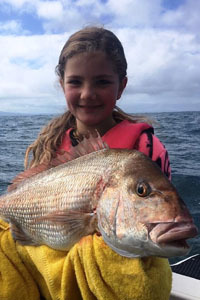 Kiwi angler Brooke Olivia Laws – age 9 – caught this impressive 9.11-kilogram (20-pound 2-ounce) snapper (squirefish) (Pagrus auratus) on October 10, 2017 while fishing off Raglan, New Zealand. Laws needed less than 10 minutes to pull the fish into the boat after it ate the chunk of skipjack tuna she was fishing on the bottom. If approved, the catch will become the new Female-Smallfry world record, which currently stands at 8.91-kilograms (19-pounds 10-ounces). 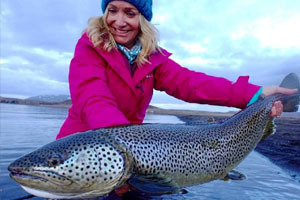 IGFA Representative Meredith J. McCord caught and released this beautiful 5.27-kilogram (11-pound 10-ounce) brown trout (Salmo trutta) on May 13, 2018 while fly fishing Iceland’s Lake Thingvallavatn. McCord played the fish for approximately 10 minutes before it was landed, documented, and released alive. If approved, the catch will become the new women’s 3-kilogram (6-pound) tippet class world record, which currently stands at 1.36-kilgrams (3-pounds).